I am in love with almost any recipe that can be prepared in advance and then just tossed in the oven. This recipe is one of those! I recently made it when a couple of friends would be stopping by for lunch. It was a quick visit so I knew I didn’t want to be in the kitchen while they were there. I assembled the whole thing that morning and then just put it in the oven when they arrived. Not only is great if you are having a couple of guests over for lunch but it is perfect for a picnic or even camping. You can make the sandwich ahead of time and then just toss the foil wrapped sandwich on the grille and turn it once or twice to keep the bottom from getting too crisp. This sandwich is made in one large sourdough loaf that can be cut into 3-5 individual servings. It is literally packed with delicious flavors that go together really well. There’s just something perfect about the combination of hearty chicken pieces and thinly sliced pastrami, especially when smothered with gooey melted Swiss cheese and pressed together with perfectly toasted bread. I promise that you won’t find anything like this is your local deli. De-lish! Cut an oval out of the top of the loaf and remove it. Tear out the inside of the bread leaving 1/2” thick bread shell. Spread mayonnaise and Dijon mustard on the inside of the loaf and the underside of the lid. Sprinkle half of the shredded Swiss in the bottom of the bread shell. 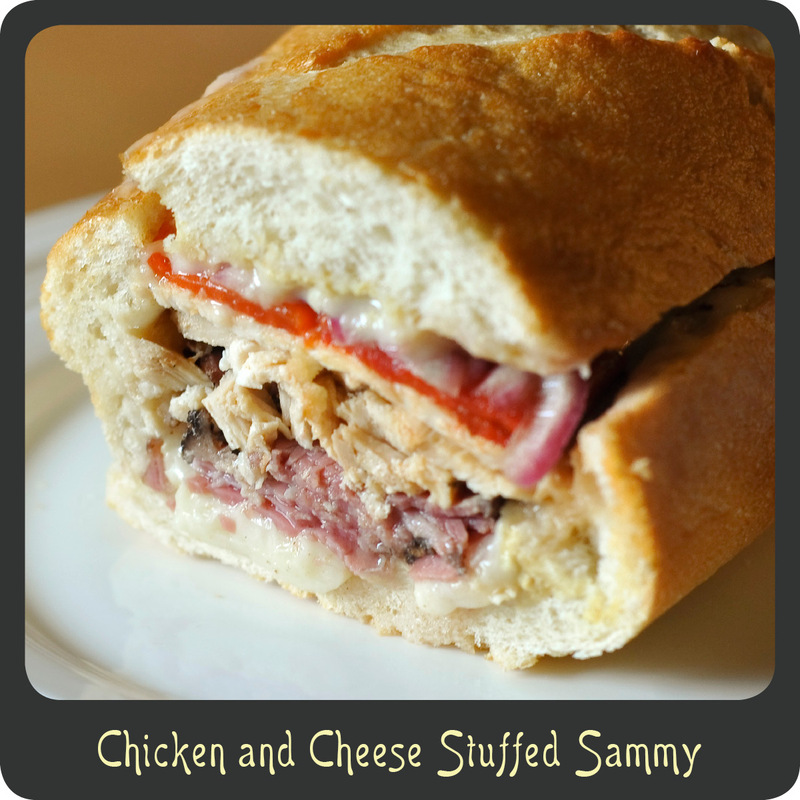 Layer in pastrami, shredded chicken, roasted red peppers, onions, and remaining cheese. Place the sandwich lid back in place and wrap tightly in foil. Bake for 20–22 minutes or until the cheese is melted and all of the ingredients are warmed through. Remove sandwich from foil and place on cutting board. Cut into desired number of servings. Are you looking for a classy appetizer to serve at your New Year’s Eve party tomorrow or any other night of the year? Search no further! These crab stuffed baby portobello mushrooms are easy, can be made ahead of time, are really elegant, and of course delicious. These will be a hit with all your guests. The crab filling is creamy with a nice little kick to it thanks to the Tabasco and the breadcrumbs give them the perfect little crunch. If you are serving a steak for a main course these can also be the perfect complementary side dish. Either way enjoy this fabulous recipe as you ring in 2013! Happy New Year everyone! Note: You can completely make and assemble the stuffed mushrooms a half day in advance and store in the fridge until ready to bake. In a medium sauté pan heat the olive oil and butter over medium-high heat. Add the garlic and shallot and sauté for 2 minutes. Add the mushroom caps and season with salt and pepper. Sauté the mushroom caps for 2 minutes. Remove the mushroom caps from the skillet and place them upside down on a baking sheet lined with parchment paper. Add the chopped bell pepper to the skillet and sauté for 1 minute. In a medium bowl mix together the crabmeat, hot sauce, Worcestershire sauce, mayonnaise, mustard, old bay seasoning, and a dash of salt and pepper. Stir in the sautéed veggies and mix well. Stuff each mushroom cap with the crab mixture and top with breadcrumbs. Bake for 12–14 minutes or until the breadcrumbs start to brown. Allow mushrooms to cool for a couple of minutes before serving.